Tharuni in collaboration with Telangana State Women Commission organised State level Consultation on Human Rights of Women at Hyderabad on 10-12-2017.Child Marriages and Child labour could not be eradicated, though legal enactments were made. So we have been campaigning for the social empowerment of women from their childhood.the Organisers announced. 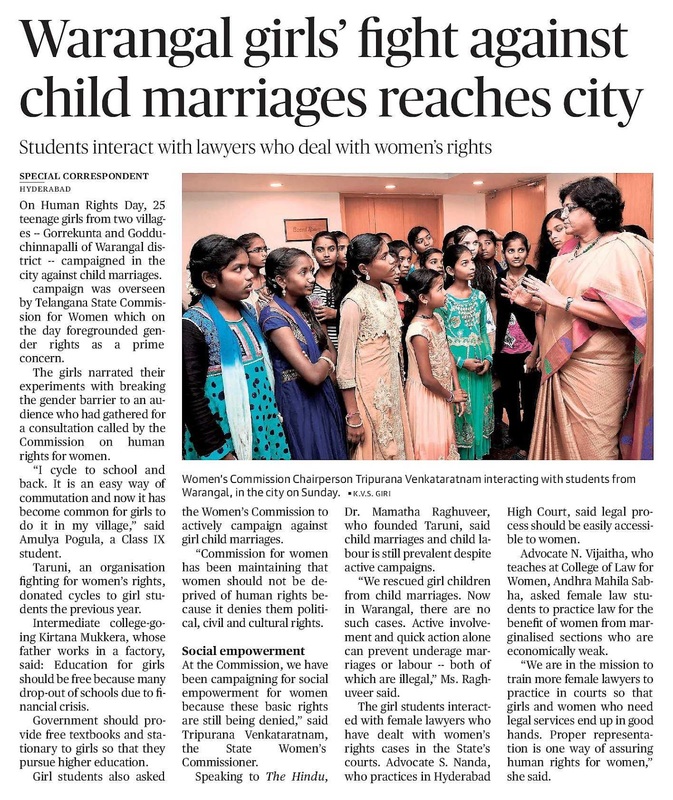 Nearly 40 adolescent girls from Warangal Rural from Bodduchintalapalli and Gorrekunta Villages came to participate in the Meeting and they reiterated that no child marriages are being held in their villages,as Tharuni is trying its best to empower them. Active involvement and quick action by Officials ,can prevent such social evils Dr. Mamatha Raghuveer, Founder Tharuni stated. Women Lawyers, Law Professors, NGOs and Students participated in the Meeting.